Intent: Create a regional “Command” NPC for The Rebellion, to add flavor to the faction and create a structure to the organization. Appearance: The most striking of Vestra's features are her tattoos. Covering her arms and body, it leaves no doubt that there are even more hidden beneath her clothing. Dark makeup often gives her a more serious appearance, sometimes even obscuring the distinction between what is makeup and what are tattoos. Often clad in robes of black and white, Vestra sports a lithe form, dark hair and eyes adding to the mystique with which she carries herself. She has no need for false names or disguises as most of her work is conducted out of they prying eyes of the Empire or the Order - or those with significant enough sway to pose a threat. Notable Possessions: Clutch of vials containing poisons and needles, Micro-vibrodagger, Concealed Throwing Knives. Secured link to Rebellion Command. Personality: Cold as ice. 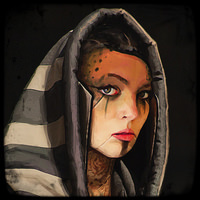 A Coruscanti native, Vestra is well versed in the language and atmosphere of the underworld. Weakness isn't an option. Though she may appear to be up front and direct, her true skill lies in her ability and penchant for subterfuge. If there's one thing you'll never see, it'll be the day Vestra smiles. The woman exudes a bitter and detached exterior, but truthfully she is quite passionate about her part in the Rebellion's network. Spy, Assassin, Diplomat: A lady of mystery, if you can call her a lady at all. Vestra isn't above using nefarious means to debase opponents and achieve her goals - or the Rebellion's. Generally considered one of the more "Wildcard" Commanders of the Rebellion, she seems to have her eyes and ears everywhere in the Core from Chandrila to Borleias. Vestra herself prefers to use weapons of subterfuge, a vibroblade in the back, a distraction, even going so far as to turn her enemies against each other instead of facing them directly. Formerly a high ranking member of "The Lost Ones", Vestra saw the threat the rapid expansion of the First Order and the Sith Empire posed to the galaxy at large, but more importantly to the vital lines of trade and smuggler's lanes which spanned outward from the core. Though she initially joined the Rebellion for personal gain, she has begun to develop a sense of belonging that she never really had with The Lost Ones. Not only this, but her experience with multiple crime rings has provided numerous contacts with which the Rebellion has been able to secure both equipment and supplies (albeit low grade). With her focus on the Core and Deep Core, Vestra is familiar with worlds such as Empress Teta, Coruscant, Duro, Abregado-Rae, and a plethora of others. Her familiarity with common smuggling lanes and methods aid her well in her role with the Rebellion. Though the core remains just outside the reach of the First Order or the Sith Empire, she is wary of blockades and interdiction activities that have in the past inhibited her ability to both acquire wealth as well as aiding the Rebellion in their efforts across the galaxy. Though she has her own reasons for joining the Rebellion, she plays her cards extremely close to her chest. Because of this she is often treated with thinly veiled distrust, though to date her information has yet to be proven unreliable. Edited by Atlas Viridian, 12 July 2018 - 11:58 AM. If you could add it to Social Information section and fill it out I can stamp this. Added and filled out. Thanks! Not a problem, this looks good now.